"The principal technique for inspecting aviation and spacecraft-wiring components used to date remains visual inspection. These inspections are unable to detect all extant flaws and are subject to discrepancies and errors. Moreover, these tests are intrusive, since brittle wire bundles are frequently moved to access more remote wiring components and can result in further damage to already cracked insulation." It should not be expected that the mechanic will be able to detect all aircraft wiring faults through visual inspection. It's the responsibility of the FAA and aircraft engineers to develope suitable inspection tools or apply age control limitations to aircraft wiring. The problem of "aging aircraft wiring" is an age problem and not a maintenance problem. No wiring is routed in proximity to oxygen, fuel, and hydraulic lines or critical flight control cables. 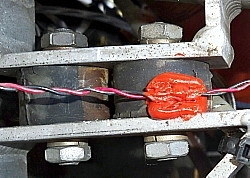 ASTM F2696-08 reads in part: "where practical, route electrical wires and cables above fluid lines and provide a 6 inch (15 cm) separation from any flammable liquid, fuel, or oxygen line, fuel tank wall, or other low voltage wiring that enters a fuel tank and requires electrical isolation to prevent an ignition hazard. Where this 6 inch cannot be maintained then wiring should be closely clamped and rigidly supported to avoid contact even assuming a broken wire or missing clamp. Protect the wire from contamination by fluids (including corrosion inhibiting compounds), flammable lint, metal shavings, or other debris. Hard materials can work their way into the wire bundle and with vibration penetrate the insulation causing electrical shorts. Fluids can soften or crack the insulation. Water and dirt become slightly conductive and lead to arc-failures. Unless advised otherwise in the maintance manual, do not mix wire insulation types in the same bundle because insulation of different hardness may create chafing damage in vibration areas. Wires and cables are supported by suitable clamps, grommets, or other devices at intervals of not more than 24 inches (61 cm). Wires must be grouped, routed and spaced so that damage to essential circuits will be minimized if there are faults in heavy current-carrying cables. The objective is to minimize the impact of the failure of a heavy current-carrying cable on any essential system wiring. Protect the wires from moisture and high temperatures; these cause wire insulation to age and crack. The minimum radii for bends in wire groups or bundles shall not be less than ten times the outside diameter of their largest wire, except at the terminal strips where wires break out at terminations or reverse direction in a bundle. Due to cold flow phenomena of teflon insulataion used in MIL-W-22759 wire, it is advised NOT to route teflon insulated wires over sharp edges and tight turns, or apply tight tie wraps to cable assemblies. Cold flow or creep is the slow movement of the insulation when under a steady-state stress. The old practice of using soft Koroseal-lacing (rubber lacing) to tie wire bundles together is much less damaging then using hard plastic tie-raps. If you are developing a wire inspection standard for your business I would suggest that you review ASTM Specification F2799-9 "Standard Practice for Maintenance of Airplane Electrical Wiring Systems." and ASTM Specification F2799-8 "Standard Practice for Inspection of Airplane Electrical Wiring Systems" These are excellent documents for any shop and are well worth the price.